It’s taken Mick Kiernan more than 10 years to upgrade his Cork bungalow, and it’s still not finished. But along the way he discovered the passive house standard and let its principles guide his way towards a warm, airtight and healthy home. 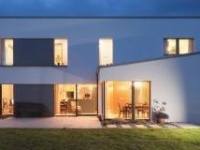 There are many pathways to passive house ‘enlightenment’ depending on whether you’re a contractor, an architect or a home-owner, but there can’t be many paths as long as Mick Kiernan’s. 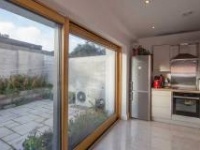 The incremental transformation of his large detached bungalow in Clonakilty, Co Cork, from a cold and draughty property to a warm, comfortable, cheap-to-run home with airtightness close to the Enerphit standard was achieved by a practical yet systematic problem-solving approach over a period of some ten years. “Both the house and I developed at the same time to a certain extent, because a lot of the problems people would have renovating was stuff I also came across, investigating, researching and solving,” says Kiernan. It helps, of course, that he works as a domestic energy consultant with his own company, Rebel Energy, and counts certification as a passive house consultant among his qualifications. But he didn’t start out ten years ago aiming to build a passive house — he only stumbled across the concept later through his interest in building physics. In addition, Kiernan has rigorously measured the before-and-after effects of the key phase of the work (which began after 2010). This is experience worth taking note of if you have an interest in retrofit. When Kiernan and his wife Ann bought the 1970s 210 square metre property as a fixer-upper in late 2003, shortly after moving to Clonakilty, he was aware it came with many problems. It had an old and poorly fitted boiler, leaking copper pipework, and poor insulation, airtightness and ventilation. This sort of first-hand experience of the building’s poor performance informed the upgrade process. “Our plan was to live in the house for at least all four seasons and then decide on the works.” In the interim, he installed a 7kW multi-fuel stove and added 100mm of fibreglass insulation in the attic “to make the house somewhat liveable while we decided how we would remodel the interior”. By 2005, they figured out what they wanted to do besides the interior remodelling and re-wiring, and this included completely new plumbing, the relocation and replacement of the old oil boiler with a more efficient model, the replacement of all radiators and valves, new ceilings, and an extensive upgrade of the heating controls. “The following winter, the house went from being unable to be heated past 17C or 18C, to heating up to a comfortable temperature in 30 minutes and I thought, ‘happy days’,” says Kiernan. But Kiernan soon became aware of the house’s poor indoor air quality. After researching ventilation systems he decided to opt for MVHR (mechanical ventilation heat recovery), and installed a system in his attic from Irish manufacturer Proair Systems, which had a “stark and immediate” effect on indoor air quality. It was at this point he also trained up on airtightness testing and thermal imaging surveying, and then tested his own house, which came back with a respectable result of 3.5m3/hr/m2 at 50 Pa. Kiernan says that aside from his decision to slab and plaster the ceiling, the building had some favourable aspects with regard to airtightness. Original external walls were wet plastered when built, and the building’s simple shape may also have helped. Kiernan did more research, which led him to learn of the passive house concept and its “demand for attention to detail, especially around the building fabric”. 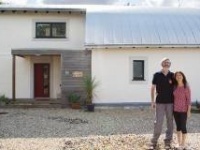 He trained as a passive house consultant in 2009. “A natural follow-on was to model my house in PHPP and see what could be done to bring the house, while comfortable enough, as close as practical to passive,” he says. The only restriction was that the ground floor had to remain untouched — the family didn’t want to move out, and Ann was keen to keep their existing floors. The match sounds like it was destined to work out well given both parties’ strong belief in doing things properly and thoroughly. O’Donovan says: “It’s the old adage of do it once and do it properly and not have to go back, and Mick was very much of that mindset, which is fantastic.” So with this meeting of like-minds, the building fabric works began in July 2014, and went on for six months. As part of the latest upgrade works, Grainger Energy Solutions externally insulated the walls with high density Rockwool. Kiernan had previously hoovered loose fill polystyrene bead from the wall cavity and had it fully filled with platinum bead. O’Donovan replaced the old concrete roof tiles and felt with new clay tiles and a Siga wind-tight breather membrane, while some rafters were re-aligned and box-ends re-constructed. The floor of the cold attic was also heavily insulated with cellulose above the existing joists, and the new external wall insulation rises up to meet the attic insulation. The new triple-glazed windows were also set flush with the outer wall and airtightened against the inner leaf walls, while the external insulation also wraps the window frames. The before and after pictures of the house reveal how much more modern it looks now, with its smooth acrylic rendering. Kiernan has been carefully monitoring his house’s energy performance since 2010, as much for personal as professional reasons. It started with an hour meter on the conventional oil boiler, which he installed in a bid to determine whether it was more economical to run the heating periodically or continuously. But he has now extended this to monitoring the internal and external temperatures, and relative humidity, at five-minute intervals. As for airtightness, that’s still a work in progress, but advances have clearly been made as it is down to 1.4m3/m2/hr, compared with 3.5m3/m2/hr previously. 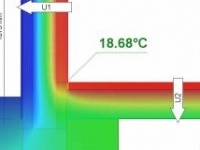 Kiernan expects to hit the Enerphit target of 1.0 ACH at 50 Pa but the building’s space heating demand is almost double the Enerphit target of 25 kWh/m2/yr – perhaps owing to a far from ideal form factor. The building’s 210 sqm of floor area is spread over a considerable area, meaning a significant amount of external surfaces through which heat can escape, in spite of the high spec fabric. And aside from anything else, he says: “You can’t put a price on quality of life”. Thermal bridging: EWI layer installed 600mm below finished floor level and rising past soffit to meet attic insulation, new thermally broken window frames moved out and wrapped in reveal EWI insulation. Y-value not calculated. Ground floor: Original concrete floor untouched for various reasons. Heating system: 10 year-old 87.5% Firebird Popular 120 conventional oil boiler supplying radiator heating and 280 litre tank for domestic hot water. Two heating zones plus DHW zone. Rudimentary but effective boiler management control system on boiler.